Published: Jan. 18, 2019 at 05:06 p.m. Updated: Jan. 18, 2019 at 07:02 p.m.
METAIRIE, La. 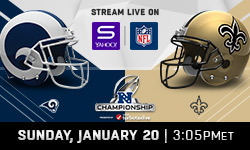 -- Week 9's matchup between the New Orleans Saints and Los Angeles Rams provided an unofficial preview of Sunday's NFC Championship Game. Various media members and even fans predicted the two teams would meet again for the right to play in Super Bowl LIII. And perhaps to no surprise, some Saints players apparently felt the same way after New Orleans took down the previously undefeated Rams, 45-35, at the Mercedes-Benz Superdome. "You could kind of feel it -- that could be the NFC Championship Game if we both handled our business," running back Mark Ingram said. "So, we both handled our business and here we go again." "We kind of had the idea that we'd see them again," Klein said. "After that game being a shootout the way it was, we got a game up on them as far as the in-conference battle. I don't want to say I foresaw this matchup happening, but we knew we'd see them again at some point." The Saints produced a 13-3 record in the regular season, won the NFC North and clinched the No. 1 seed in the postseason. The Rams also finished with a 13-3 record, won the NFC West and secured the No. 2 seed. Quarterback Drew Brees compared the 2018 season to 2009, when the Saints won the Super Bowl. The Saints were then on a collision course with the Minnesota Vikings toward the NFC Championship Game, and Brees said he and his teammates were monitoring what was going on with the Vikings throughout the season. This time around, Brees' occasional focus fell on Sunday's opponent. "As we looked across the league and saw what the Rams were doing and the success that they were having," Brees said. "They're [a] phenomenal team and they had a great season. "Obviously, we played them midseason and it was a hard-fought game on both sides of the ball. But I think we had a feeling then that obviously we aspired to be in this situation and we all had a feeling that they were going to be the team that we might face again. So, here we are." Needless to say, the NFC has the best-case scenario for the playoffs featuring the two best conference teams, and the numbers don't lie. The Rams' and Saints' offenses were two of the top units in the league the past season, with the Rams ranking second in points per game (32.9) and the Saints finishing third (31.5). The Saints and Rams were also the only two teams in the league to score 30-plus passing touchdowns, 20-plus rushing touchdowns and produce a plus-140-point differential and plus-400-yard differential. When it comes to opponents, both teams didn't take an easy route to the postseason. The Saints went 4-1, including the playoffs, against teams advancing beyond the regular season, while the Rams posted a 5-3 mark. The three losses the Rams suffered came at the hands of the Saints, Philadelphia Eagles and Chicago Bears, while the Saints' loss came against the Dallas Cowboys. Still, defensive end Alex Okafor said he personally didn't track every week what the Rams were doing on the West Coast, preferring to place most of his focus on his team and helping to control what they could. But Okafor ultimately conceded he would peek every now and then to see how the race for the No. 1 seed was going, which the Saints clinched in Week 16. The scenarios, of course, set the table for Sunday's game. "We could kind of see from a distance that's what it was coming toward: us versus the Rams," Okafor said. "We were both in first place at the time, so it only made sense. "And, honestly, I think that's what the people want, as well. It's going to be exciting on Sunday. I think everybody here is revved up about this game, and it's why you play it. It's going to be bright lights." A desirable matchup featuring two elite teams under the glare of bright lights, indeed.